There’s something great about investing in companies that can trace their history back over a hundred years; companies like L’Oréal that began with a hair dye formulated by a young French chemist five years before the beginning of the First World War. That single product in the early 20th century has now grown into hundreds of different ones, spanning across dozens of household brand names today. It gives you a stability and earnings quality that maybe only a few dozen other global companies can offer. It means that when you see a once in a generational economic environment like a 2008/2009 scenario creeping up on you, earnings hold up and the dividend stays intact. This is a company in which after tax income regularly comes in at about 50% of net fixed assets. That’s 50% of the value of the property, plant and equipment used to make their products hitting the bottom line as net profits every year – it’s a huge long-term compounding machine when you pick it up at reasonable prices. That’s probably why Liliane Bettencourt and Nestlé own well over 50% of L’Oréal between them. In the mid 1970’s amid fears that the French government would nationalize the company Bettencourt swapped out half of her holding for 3% of Nestlé. That’s a remarkable appreciation for long-term compounding. There’s no way she wanted to give up that kind of wealth creation. If it was going to be inevitable she would act first and replace it with an ownership stake in one of the few global companies that could substitute for L’Oréal. Take a look at the twenty year investment returns. Back in 1995 the shares were trading at a then price to earnings multiple of about 23.5x (pretty close to today’s valuation of just under 24x full year earnings). Earnings per-share growth since then has registered somewhere in the region of 10% compounded annually and an investor would have received €11,470 in dividend payments based on a notional investment of €10,000 back in 1995 (adjusted for French withholding taxes). In addition to receiving the initial investment back via dividend payments the starting capital has also grown by roughly 11.5% per year. Total return, ignoring the effects of any dividend reinvestment, would therefore be roughly in the region of €115,000 on the starting €10,000 capital. When I first wrote about L’Oréal a couple of months ago for Seeking Alpha one of the points raised was, naturally, concerning valuation. Or more specifically that L’Oréal was currently overvalued. Grab a P/E chart of L’Oréal and you will see that the company’s valuation is roughly the same today as it was back then. To put that another way all the shareholder returns mentioned above were as a result of dividends and underlying earnings growth rather than the benefits of an expanding valuation multiple. That’s why an investment in the stock has delivered such incredible returns, despite a valuation that wasn’t noticeably cheap then and definitely isn’t noticeably cheap now. It’s also part of the reason why an investment in the Nifty Fifty for example has still managed to deliver very attractive returns, even for those who bought in at peak mania in the early 1970’s. They’ve seen those earnings multiples contract – working against them in terms of returns – but earnings growth more than compensates for it. They had growth, quality and time on their side. They had reinvesting dividends in the bear market of 1973/74 on their side – putting them to work by buying more stock as it became cheap. Okay, so the company is now a $100bn giant online twenty years ago. Growth will therefore not match that historical 10% rate, but it doesn’t necessarily need to. 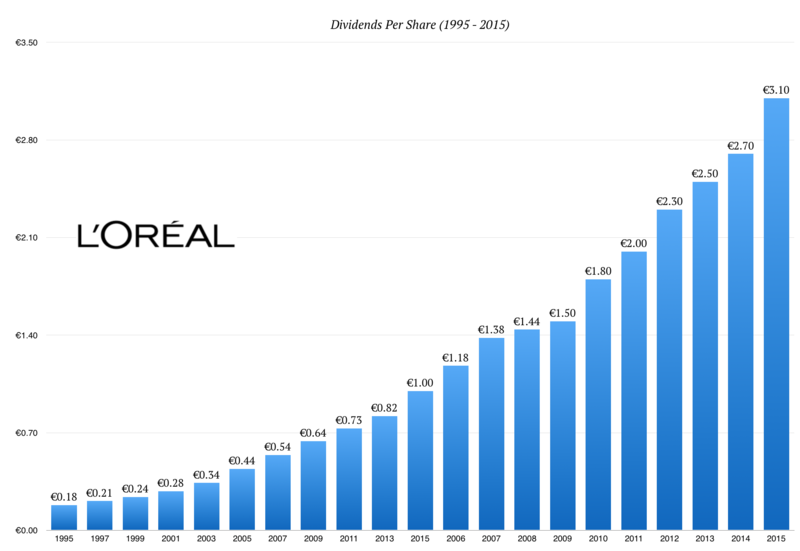 Let’s say that L’Oréal posts half the organic growth of the last twenty years – that means about 5% annual growth going forward. Now factor in the 4% that they are able to return annually in the form of dividends and periodic share buybacks too. That leaves you in the strong position where you can even factor in some multiple contraction and still manage come out with attractive returns. If the multiple expands further your expected returns will decrease and vice-versa, so at the moment it’s right on the edge of an acceptable investment. By that I mean the margin of safety starts to disappear when your talking about a P/E multiple in the high twenties. The key to this though is two-fold. Firstly is the assumption they are able to sustain those business economics over a long time frame. When you’re dealing with a reliable, stodgy sector where branding power plays a big role then this is fairly likely. As long as you see the company maintain spending on advertising and marketing to nurture the brand then it becomes a very reasonable assumption that they will be able to maintain earnings power. The second is that as an investor you are absolutely prepared to hold the stock for a long time. By that we’re talking in terms of decades rather than years. From a price-to-earnings ratio in the twenties the stock could drop 30-40% and it wouldn’t be out of the ordinary. In the meantime you would get supported by a healthy dividend with the knowledge that reinvesting it at higher yields is solid blue chip value investing. It boosts the returns in the years ahead and compensates for buying in at a high value multiple. In the murky depths of the 2009 bear market you maybe got a 3% yield on L’Oréal stock assuming absolutely perfectly timing. The P/E ratio got down to a multiple of about 15x prior year earnings at that point. That’s how high quality the company is: assuming you perfectly timed your buy in the worst economic environment since the 1930’s the cheapest you could have got was about 15x annual profits. There will be periods where L’Oréal sees heavy declines, or multi-year stretches where the stock price does absolutely nothing at all. The share price went nowhere between 2000 and 2012 for example. In the meantime though you would get to enjoy all the dividend payments, safe in the knowledge that as long as there is a market for beauty products then this is another keeper that will still be around in the decades to come. @2017 - The Compound Investor. All Rights Reserved.